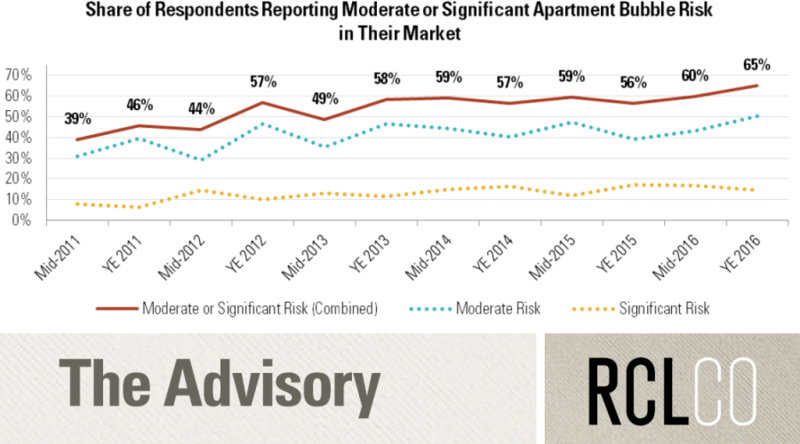 In RCLCO’s Midyear 2016 Market Sentiment Survey, respondents seemed nervous about the future. The Brexit vote had just happened. Historically low spreads between two-year and 10-year Treasury notes, poor stock market performance, and falling oil prices had many worried about the possibility of a near-term recession. 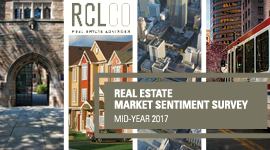 Sentiment about real estate conditions dropped to levels not measured by RCLCO’s survey since 2011, and 80% of respondents thought the next real estate downturn would begin by 2018. The results are in: sentiment is up from six months ago, but still down compared with year-end 2015. The results suggest that we continue to find a surprising amount of additional runway in the current real estate cycle, which is now 7.5 years long and counting. Compared with six months ago, sentiment about current national real estate conditions has rebounded somewhat. Fifty-six percent of survey respondents say national real estate market conditions are moderately or significantly better today than they were 12 months before. Just six months ago, fewer than one-half of respondents (45%) thought conditions had improved. The share of respondents reporting worse market conditions today than one year ago remains a small minority (15%), and even lower than in mid-2015 (19%). 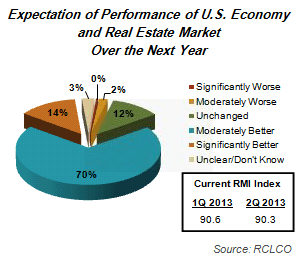 The uptick in sentiment caused RCLCO’s Real Estate Market Index (RMI), which measures sentiment on a 100-point scale, to increase to 70.8 today, up from 63.1 in mid-2016. Furthermore, predictions about future sentiment are also more positive than they were six months ago. Current sentiment is 14 points above where respondents predicted it would be today in mid-2016, and respondents today do not predict as sharp a decline in sentiment over the next 12 months as they did previously. Despite the bump, sentiment has still been trending down since mid-2015. Current sentiment is lower today than it was this time last year, and respondents still predict sentiment will be lower this time next year than it is today. In other words, the uptick in sentiment does not suggest we bypassed a downturn; rather, real estate markets continue to experience the characteristics of the mature phase of the current real estate cycle. Curiously, compared with predictions made one year ago on the year-end 2015 survey, higher shares of respondents are anticipating both better and worse conditions. This time last year, 47% of respondents predicted national real estate conditions would improve moderately or significantly over the next 12 months. Today, that share has risen to 52%. At the same time, however, the share of respondents forecasting moderately or significantly worse conditions has also increased, from 17% to 23%. The increase in both positive and negative predictions somewhat offset each other, which explains why future RMI is expected to experience only very slight decline over the next year. So, if higher shares of respondents believe real estate conditions will get better and worse, what prediction lost share? The percentage of respondents anticipating “unchanged” market conditions. This divergence suggests that respondents see real estate markets at a potential turning point: either markets continue to experience longer-than-expected runway in the current real estate cycle, or growth slows and markets appear to move closer to a potential downturn. 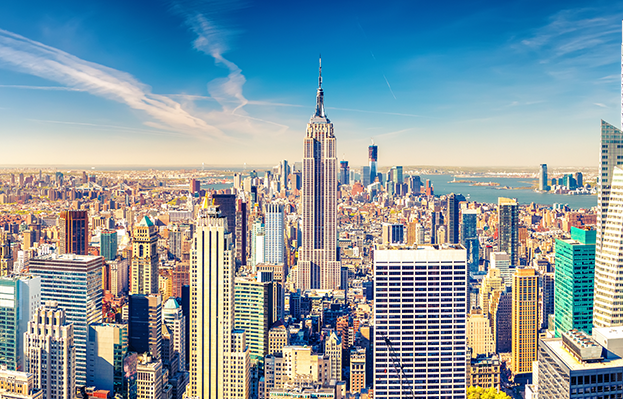 A majority of respondents, 59%, predict that President-elect Trump will have a somewhat or very positive impact on U.S. real estate markets over the next year. By comparison, only 17% predict the President-elect to have a somewhat or very negative impact on real estate. Those who believe he will have a positive impact tend to cite the expectation of lessened regulation, tax cuts, infrastructure investment, and generally more business-friendly policies, whereas those who predict he will have a negative or unknown impact are more likely to point to his unpredictability and the lack of detail around many of his policy proposals. Many respondents who expect President-elect Trump to have a neutral impact believe the broader real estate cycle and market conditions would outweigh any potential political factors. Perhaps not surprisingly, respondents’ views of President-elect Trump correlate with their predictions for how the U.S. real estate markets will perform over the next year. Thus opinions about President-elect Trump and the impact of the new Republican Congress and administration may explain the divergence in sentiment highlighted above. Of the respondents who believe President-elect Trump would have a negative impact on the nation’s real estate conditions, only 11% anticipate that real estate market conditions will be moderately or significantly better one year from now. However, among the much larger share of respondents who expect President-elect Trump to positively impact the real estate market, the sentiment is reversed: only 12% of these respondents expect U.S. real estate conditions to be moderately or significantly worse one year from now. Instead, 68% of these respondents (which comprises 40% of the total survey sample) predict that market conditions will be better 12 months from now than they are today. 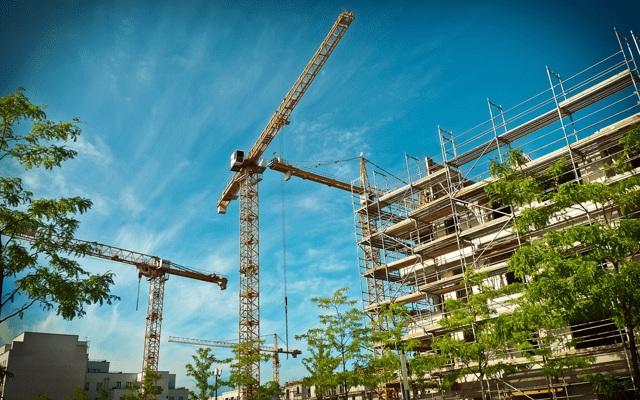 In response to the bump in sentiment about national real estate market conditions, respondents pushed back their predictions for the timing of the next real estate downturn. While a quarter of respondents anticipate a downturn in 2017 six months ago, only 14% predict the downturn to begin in 2017 currently. Instead, 39% of respondents now say the next downturn will not begin until 2019 or later, as compared to 20% six months ago. Put differently, 80% of respondents thought the next downturn would begin before 2019 six months ago, but today, only 61% of respondents feel that way. 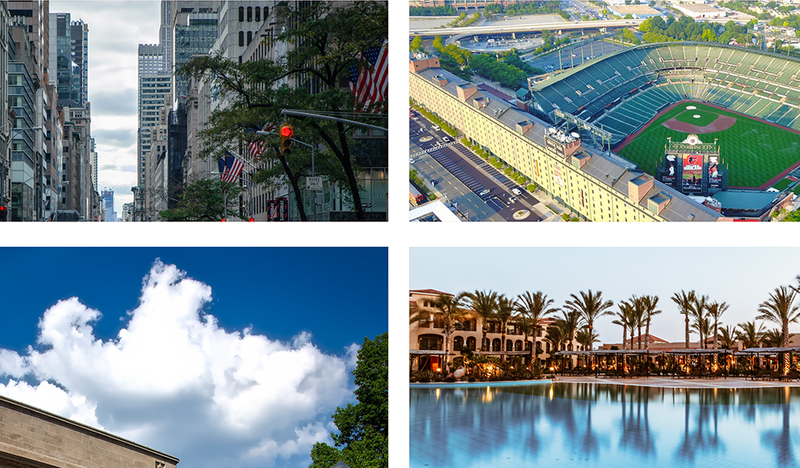 RCLCO’s Market Sentiment Survey tracks the sentiment of a highly experienced pool of real estate professionals from across the country and across the field. 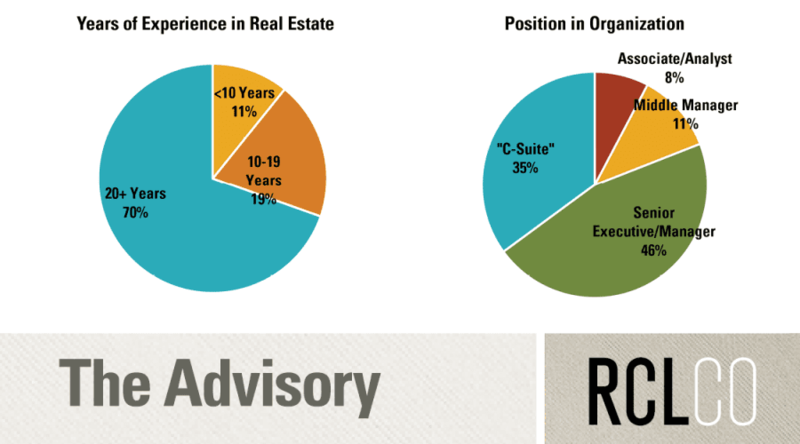 Seventy percent of respondents have worked in the real estate industry for 20 years or more, and 81% of respondents are C-suite or senior executives in their organizations. Developers and builders comprise the largest share of respondents, at 38% of the sample. Another 22% are investors or capital allocators, followed by 14% in design or architecture firms. The remaining quarter of respondents come from a variety of other types of organizations within the real estate industry.